With technology continuing to evolve at a rapid pace, it is easy for businesses and individuals alike to regularly accumulate outmoded electronic waste or “e-waste” (computers, computer peripherals, televisions, small electronic equipment, etc.). However, it is cumbersome to dispose of e-waste, particularly because under a new New York State Environmental Conservation Law, it is now illegal to combine e-waste with regular trash and recycling. The Rosenblum Companies’ commitment to the environment extends beyond sustainability initiatives for our buildings and grounds. To assist our valued tenants with this new requirement, and ensure that electronic waste is safely and properly handled, Rosenblum contracted with eLot Recycling for our first semi-annual electronics recycling day at Corporate Plaza and Great Oaks office parks in June. Tenants were able to drop off any unwanted electronic waste from their offices and homes at no cost. 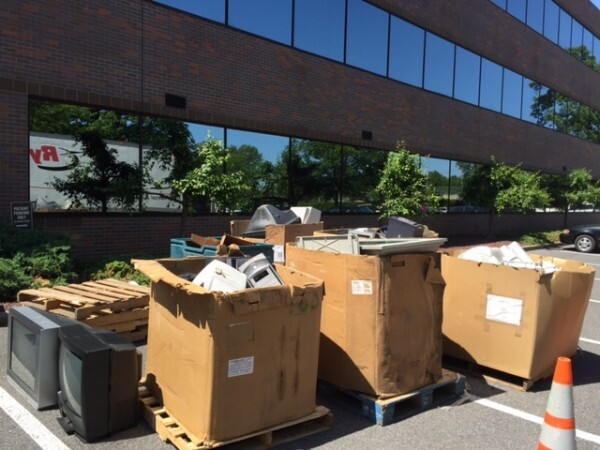 The Rosenblum Companies is proud to have sponsored the collection of 4 pallets and 11 bulk bins of waste, encompassing over 300 pounds of television and CRT monitor waste. Bulk bins piled high with electronic waste at Great Oaks Office Park.